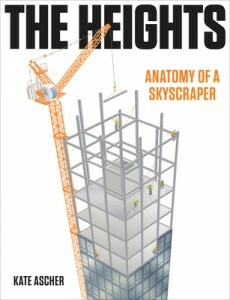 I’m reviewing The Heights: Anatomy of the Skyscraper by Kate Ascher as part of a TLC Book Tour. Other bloggers are also reviewing the book, and you can find links to their reviews here. I received a complimentary copy of the book, and I’d like to send it to a reader if anyone is interested in reading it. If you’d like it, just comment saying so by Monday, December 5th. If multiple readers would like it, I’ll pick one at random. The Heights reads like a textbook for Skyscrapers 101. It’s full of interesting skyscraper facts along with diagrams and timelines. I learned a lot from the book, having no background in architecture or engineering. For someone who has studied these subjects though, I imagine that this book would be too elementary. However for me, it offered a useful overview of the history and science of skyscrapers. Ascher details the process of planning, constructing, and owning skyscrapers, from the details of different types of foundations to building maintenance. She explains some of the challenges that skyscrapers present that I might not have thought about. For example, buildings with unusual designs that do not have straight sides must be designed with mechanisms for reaching the windows for cleaning and maintenance. Although the annual cost of maintenance pales in comparison to the cost of constructing a building, over the life of a building — which can be upward of 100 years–it is much more significant. Holding aside capital replacement and reinvestment, the cost of the initial structure itself represents only about 5 to 10 percent of the total cost of owning a building over a 30-year period. The visuals in the book were particularly well done. For example, Ascher offers visualizations of the real estate available within a skyscraper and then compares that to what the same amount of office, retail, and housing would likely look like in the suburbs. She also provides interesting diagrams that portray different elevator configurations that supertall buildings can use to maximize rentable building area and maximize elevator efficiency. The book is also packed with trivia. I learned that today’s elevator speeds are not limited by technology, but rather by the human ear. The owners of the Sears Tower in Chicago were sued when elevator passengers suffered ear drum damage during the descent. Taipei 101, one of the world’s tallest buildings, features an air-pressurization system to protect riders’ ears. Ears adjust more easily on the ascent, so elevators can travel up more quickly than down, adding another variable to consider in the effort to move people between floors efficiently. Ascher discusses the cultural and legal differences that shape skyscrapers around the world. In Europe, all employees must work within 25-feet of natural light, leading to smaller floor plates than we often see in Asia or the United States. While the United States dominated the first century of the skyscraper, today’s tallest buildings and the tallest proposed buildings are in Asia and the Middle East. This is due in part to American zoning restriction, but in larger part to financing opportunities. It . . . established setback rules for specific tower heights, thereby ensuring that light and air would continue to reach the street and that towering street walls like the Equitable’s could never be built again. Of course tall buildings cast long shadows, but suggesting that skyscrapers actually block air from reaching the sidewalk is not doing this urban form any favors. I want it! Thanks in advance if I’m the one chosen. Does Ascher talk about different skyscraper styles – e.g. rising straight up like the Twin Towers vs. tapering like the Empire State Building? Yes, she certainly discusses various skyscraper designs, and the complications that having setbacks like the Empire State Building can cause. While she doesn’t discuss the Empire State Building specifically, I don’t believe, she does talk about how zoning in NYC has led to buildings that are shaped similarly. Of the four people who were interested in The Heights, I randomly selected Mike to receive my copy. Mike, please email me at [email protected] with your address, and I’ll send it off to you as soon as possible. Thanks all for your interest in the book.